Crown delivers them “ready-to-charge” according to your predetermined specifications. User displays are designed for easy reading, even from a distance. Install the battery and it automatically kicks into charge. Gold Control chargers select the proper voltage and charging time for the connected battery. If a problem does occur, simply press the self-diagnostic button and you’ll find out the cause. It’s as easy as that. Multiple voltages on your batteries used to require multiple chargers; Not with PowerHouse. 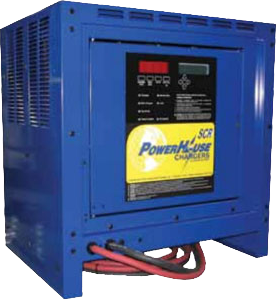 For example, one 24-cell (48 volt) SCR charger with Gold Control will safely charge 24-, 18-, and 12-cell batteries automatically with no user adjustments. Voltage mismatch, reverse polarity and short circuit protection are also design features that protect improperly connected batteries from damage. Fully charged batteries within 8 hours. Convection cooled with no moving parts. Single and three-phase AC input options. 208/240/480 field selectable AC voltages. Advanced microprocessor controls with precise charging and termination algorithms. For standard flooded or sealed maintenance-free batteries.